Due to the increased liquidity on BitMEX’s Bitcoin/USD contracts, a six-month fixed-date contract can finally be listed! This new contract is XBTM18, and it expires 29 June 2018. 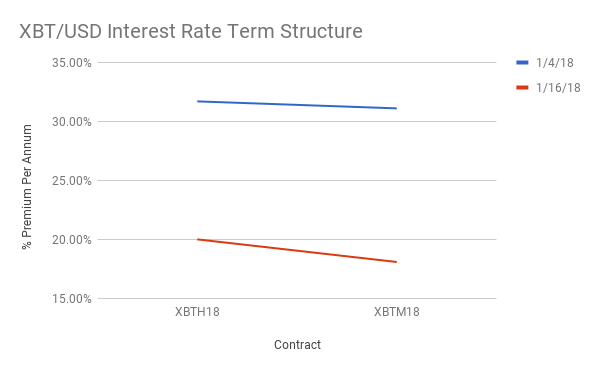 Now we have the beginnings of a Bitcoin/USD contract-interest-rate term structure. Valuable insights can be gleaned into the market’s perception of the future value of Bitcoin from the premium or discount of these contracts. The above chart illustrates the annualised percentage premium of XBTH18 (March 2018) and XBTM18 (June 2018) on 4 January 2018 and 16 January 2018. Looking at the 4 January observations, I am immediately struck by how flat the curve is. Given the explosive Bitcoin price volatility in December, I would expect XBTM18 to trade significantly lower or higher than XBTH18 in annualised percentage terms. If you believe that the price of Bitcoin will rise, this is a price-neutral way to express that view. Why not just go naked long? If your prognosis is incorrect, your absolute losses will be much less using a 3m versus 6m basis trade. If the spot price were to continue upwards over the next few weeks, XBTM18 would outperform XBTH18. That is due to traders purchasing the long end of the curve in anticipation of much higher prices come June. This outperformance manifests itself by the XBTM18 annualised premium rising much higher than XBTH18’s. If you believe the price of Bitcoin will fall, this is a price-neutral way to express that view. Again, in case you are wrong, you want to limit the absolute losses via a basis trade. If the spot price were to continue downwards over the next few weeks, XBTM18 would underperform XBTH18. That is due to traders selling the long end of the curve in anticipation of much lower prices come June. Spot prices fell, and the curve parallel-shifted lower. In addition, XBTM18 underperformed XBTH18 over the 12-day time period. In annualised percentage terms on 4 January and 16 January, XBTM18 was 0.59% and 1.92% cheaper than XBTH18, respectively. The change in average spot price between both days was down 8.19%. The XBTM18 basis held up quite well, all things considered. That indicates that there is a strong bid under XBTM18. The market does not expect the Bitcoin spot armageddon to continue into the summer. Or, said another way, hope springs eternal. And hope plus 100x leverage is a strong cocktail. This bout of weaker prices allows an excellent entry point into this trade. If you believe the price will soon test $10,000 and maybe $8,000, wait for the dip. During the despair, traders will short the bottom and push the whole curve close to flat premium. If the market is super bearish, XBTM18 might even trade at a discount. Then you back up the truck, and go all in. Otherwise, the current curve structure still affords an excellent entry point. My base case is that the curve will parallel-shift upwards to an annualised 40%, and XBTM18 will move to flat vs. XBTH18. In the bullish case, XBTM18’s premium will continue to outperform and hit 50% to 60% annualised. For the trade described above, you earn theta by being short XBTH18 and pay theta by being long XBTM18. This is because both contracts trade at a premium. Currently the net theta is +0.0053% per day. A positive theta means the trade pays for itself. Said another way, the trade has positive carry. One caveat: your positive XBTH18 theta position evaporates in 73 days once it expires. The clock is ticking. The trade must move into your favour before XBTH18 expires. If you roll into another 3m versus 6m calendar spread in late March, the levels may not be attractive and/or you may lock in a loss.